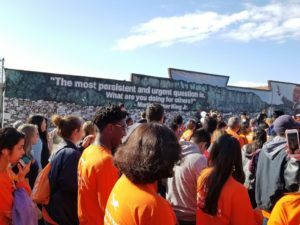 UTSA students participated in the 2018 MLK March! 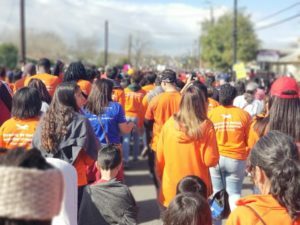 UTSA Engaged is an online portal used by GivePulse that allows UTSA students, faculty, staff and campus organizations to record their service hours, find service opportunities and connect with various non-profit and community organizations. Through UTSA Engaged those associated with UTSA are added to subgroups and utilize the portal to keep track of all service events and record hours. Non-profit affiliates post opportunities and assist us in verifying service hours. Search for your organization to verify that you don’t already have an account established. In some cases organizations have accounts that need to be claimed and or past employees have set up accounts. You can click “claim account” or contact support@givepulse.com to report a change in an account administrator. List your first event on the system. Click continue and proceed as instructed. Once you have set up your account, you can begin to list numerous events. Students respond best to specific dates and times for service opportunities. The system allows, one time opportunity, reoccurring, multi-day, and timeslot set ups for your opportunities. For example if you need volunteers every Tuesday from 3-5 pm, you create one event as a reoccurring opportunity. Opportunities are displayed chronologically on the wall by date. Open Opportunity listings are searchable and allow for volunteer referrals. Students that register for your opportunities are added to your organization and can be reached out to for future opportunities. If you have any questions, please email servicelearning@utsa.edu or call 210-458-2660.